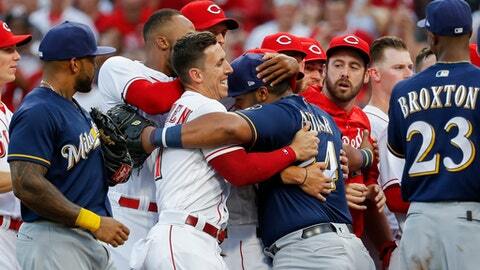 CINCINNATI (AP) Joey Votto removed his helmet and exchanged words with Milwaukee catcher Erik Kratz during an at-bat in the third inning Thursday night, prompting the Brewers and Reds to clear the benches. Votto thought he’d drawn a walk on a 3-1 pitch from Junior Guerra and started toward first base, but plate umpire Roberto Ortiz called it a strike. Votto and Kratz traded words as the Reds first baseman got back in the box, prompting their teammates to take to the field. When play resumed, Votto flied out.